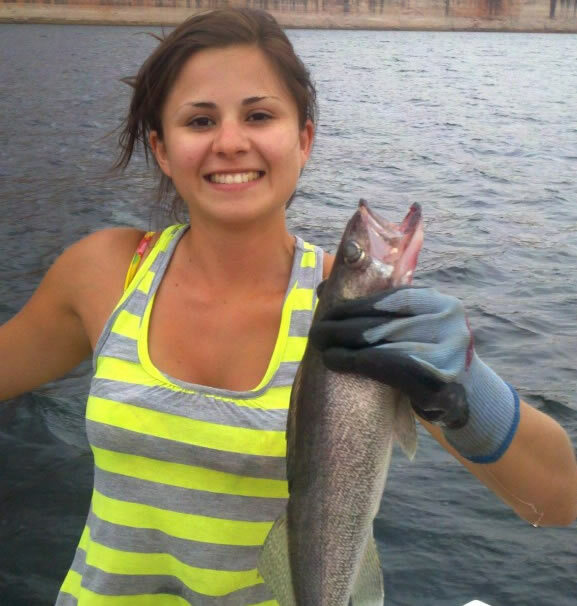 Lake Powell sportfish were warm and happy when tucked in for the winter in 2015. Shad production has been at peak levels for the past two summer seasons. Gizzard shad dependably produce a consistent number of offspring, but in 2014 – 2015, threadfin shad, were produced in record numbers. Stripers, bass and walleye absolutely “love” threadfin shad. The shad boom came at just the right time for an aging striper population comprised of old stripers that were worn out from searching for the scarce shad supply in 2012. The shad resurgence has created a very large population of husky 2-4 year old striped bass heading into 2016. The winners here are the anglers that like to catch lots of 3-4 pound stripers. It should be a banner year for striper fishing in the spring. The details of how to catch these fish is yet to be determined. The key to understanding where and how to catch fish again depends on threadfin shad. Another boom year for threadfin shad would push striped bass size and numbers to the next level. Stripers would grow to 4-5 pounds for schooling fish and much larger size for the free roaming, genetically superior fish destined for trophy size. It is very rare for three consecutive threadfin shad booms to occur. More likely threadfin shad numbers will be small in comparison to the previous two years. If that happens then stripers will maintain their current size and weight and become easy targets for bait fishermen using anchovies or dead shad in deep water. I am hoping for a shad boom which makes stripers harder to find in the spring as they stay in the backs of the major canyons instead of running to the deep main channel areas. I like trolling, casting and spooning at 40 feet while searching for schools in the murky water at the shallow end of the canyon. Fishing and catching is easier in the spring if the striper schools congregate in deep water at the dam or near Moki Wall near Bullfrog. However, if threadfin shad thrive in 2016 then the extremely addicting summer striper boils will blow up once more. The striper summary is that it will be a good year no matter what. There are lots of fish to catch and the spring reports in March and April will dictate where to look and how to target these fish schools. Largemouth bass and crappie also face a double standard. These are brush loving fish that are currently enjoying some aquatic weeds that have grown in the clear shallow water in the backs of coves and canyons. When water warms and spring runoff occurs, bass and crappie must come shallow to spawn. Largemouth and crappie depend on brush for food and shelter. A large snow melt and runoff will allow the lake to rise quickly and cover terrestrial brush that now is found 15 feet above lake level. If the lake comes up 20 feet then brush-loving fish will be able to live and hunt in luxury of these brushy condos. If rain and snow does not persist in March and April then largemouth and crappie will suffer while rock dwelling smallmouth will thrive. Walleye are abundant but secretive. Since they feed in low light it is necessary to fish for them at night or in low light at dawn and dusk. They are vulnerable in May when the water warms rapidly and food is not readily available. In these conditions walleye must feed during the day to obtain enough food to thrive. It is wise to use live worms on bass jigs in May to catch many of these great tasting food fish. There is no limit on walleye so fill the freezer in May for good eating all year long. We are planning to tag some walleye in late April and then pass out prizes to the lucky anglers that catch a tagged fish. The purpose is to make more anglers aware of walleye presence and teach them the specific techniques needed to target walleye in Lake Powell. Lake Powell really has a very complimentary population of fish that respond to existing conditions which favor one fish species this year and another the next. In any given year there will be different fish species and fishing techniques that work well. Each season will favor a certain group of fish and different effective fishing techniques. I will do my best to gather reports on fish locations, species and techniques which I will then share with you to make it easier to find a fish finding starting point when arriving at this beautiful destination from your home far away.